2011 Topps Chrome Baseball is highlighted by USA Baseball Redemption Autographs, USA Baseball Team Set Redemptions, 60th Anniversary Autographs and a Rookie Autograph checklist featuring Brandon Belt, Freddie Freeman, Michael Pineda and more. 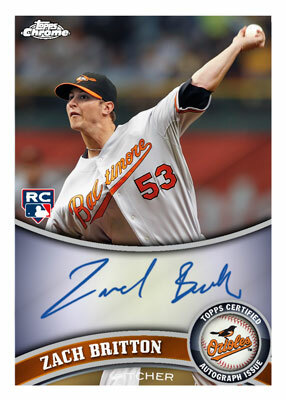 2011 Topps Chrome does not suffer from a bad case of the "Bowman Bends". Last year they apparently used a different printing company for Topps and Bowman Chrome, which is why those two suffered from the bends unlike 2010 Bowman Baseball or 2010 Bowman Draft. Rookie Autograph Checklist will include: Freddie Freeman, Tsuyoshi Nishioka, Brandon Belt, Michael Pineda, Zach Britton, Chris Sale, Kyle Drabek, Mike Minor and more! Every autograph will be of the on-card variety. 1/1 Canary Parallels will be present as they were in 2011 Topps Baseball, only these will be chromed out versions. 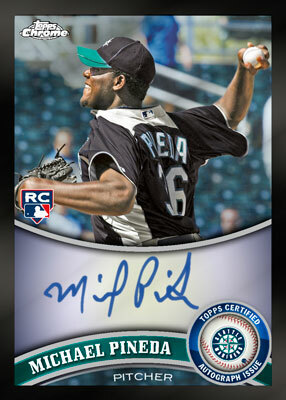 Another new parallel inclusion will be Sepia Refractors /99. USA Baseball Autograph Redemptions featuring 2011 Collegiate National Team including new Diamond Die-Cut Refractor Versions in addition to your typical refractology. NEW USA Baseball Team Set Redemptions - Pull one, win the US National team set! Refractology - 1/1 Superfractors, 1/1 Canary Diamond Parallels (no auto versions), 1/4 Printing Plates (tis true), Red Refractors /25, Gold Refractors /50, Sepia Refractors, Blue Refractors /199 and Standard Refractors (standard refractor autographs /499, non-auto not numbered). Good: Improved quality control, a strong selection of rookie autographs, USA autographs are considered a bonus hit, inserts and new Refractor colors are refreshing. Bad: Eric Hosmer's autograph is a redemption, only two autographs per box, takes multiple boxes to complete a base set. 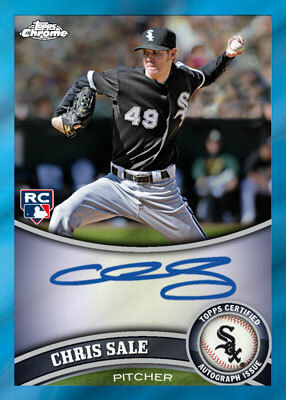 The Bottom Line: Overall, 2011 Topps Chrome Baseball is an improvement from the 2010 version that was plagued by many quality control issues. They've been corrected here. The autograph checklist, which includes Eric Hosmer, Michael Pineda and Brandon Belt , is much deeper and feels less watered-down than in past years. You can expect to pay $60-80 per box and get one Refractor or insert per pack. This set is highly recommended. 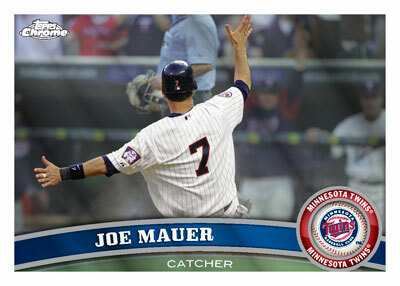 This year's Topps base design looks even better in Chrome. The inclusion of the Black, Sepia and Atomic Refractors are particularly attractive and add more of a challenge for player collectors. The checklist is a solid offering, featuring this year's top rookies. The autograph checklist has several Rookie of the Year candidates, including Freddie Freeman, Mark Trumbo, and Craig Kimbrel. The 1996 Topps Chrome and Heritage inserts compliment the base set nicely. Topps Chrome is always a fun product to break. 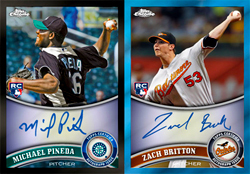 Pulling two autographs, several Refractors and a handful of inserts provides plenty of bang. Whether you're trying to build the set or add key rookies to your collection, this is a great product. By far one of my favorite sets each year, the photography, chrome technology and rookie autographs make for a fun set to put together. It will take a few boxes to complete a base set, but you're not left with the feeling of having worthless commons as extras. The inserts and Refractors add extra value and challenge. nice. chrome baseball is one of my 5 favorite sets that I collect every year. I really hope they have fixed the bends issues like they’ve claimed to. I had some cards last year that I just threw away because they were so jacked up. The Chrome cards in Bowman Draft last year still had “Chrome bend” but not nearly as bad as 2010 Topps Chrome. Can’t imagine I’ll buy a box of this since last year’s hobby boxes were such a disaster with the watered down auto checklist and seemingly all the colored refractors being packed in retail. Wondering should I pre sale a case, or wait? yeah I know dumb question…. TylerG (ID 23202) � I would say wait for it. Last year lots of people lost money overpaying for Topps Chrome preorders. 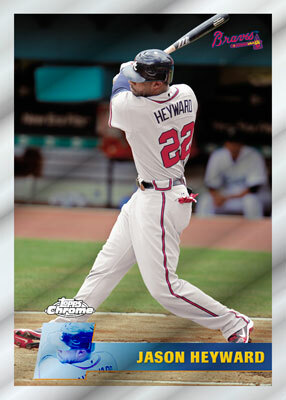 don’t really like the chrome’s…more of a bowman fan…even though this years bowman was disappointing. 2011 Topps Chrome Mike Minor Superfractor Auto RC 1 1 BGS 9.5 Texas Rangers HOT!